Grafton — The wind energy developer that planned to erect more than three dozen turbines in Grafton, Danbury and Alexandria has scaled back the project, leaving Grafton out of the mix. Some Grafton officials and residents said they are fine with that. Edward Cherian, of Iberdrola Renewables, the company behind two other New Hampshire wind farms, including one in Lempster, said on Wednesday the Wild Meadows project had been cut back nearly 40 percent, lowering the number of proposed wind turbines to 23. Cherian said there were several factors behind the decision, including economic feasibility and the topography of the site. While the presence of wetlands specifically affected the proposed Grafton site, Cherian said opposition from the community also played into Iberdrola’s decision. “We recognized that in Grafton, as in other towns, there are people that don’t support the project,” Cherian said. Darrow said concerns included potential damage to town infrastructure from construction vehicles, and the aesthetic impacts to the town. 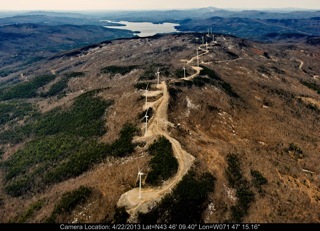 Despite the decrease of turbines involved in the Wild Meadows project, renderings on Iberdrola’s website show that the 492-feet-tall towers can be seen from the top of Cardigan Mountain. “I am glad it’s not going into Grafton because it was causing an awful lot of controversy here that I hope will die down now,” said Grafton resident Jeremy Olson, who made an unsuccessful bid as a Democrat for state representative in 2012. Olson was one of 366 residents who voted at Town Meeting in March in opposition to the Wild Meadows project. One-hundred-and-sixty-six residents voted in favor. A news release sent to the Valley News last week from the New Hampshire Community Rights Network suggested that the ordinance caused Iberdrola to pull out of Grafton. “When Iberdrola listened … they heard Grafton has an ordinance that elevates the rights of the community and it’s ecosystems over corporate greed,” Grafton resident Cindy Kudlik said in the release. Kudlik did not return calls seeking comment on Wednesday. The scaled-back version of the estimated $150 million renewable energy project is moving ahead in Danbury and Alexandria, with 15 turbines slated for Merrimack County and eight in Grafton County. Town and county lines aside, the turbines would be built near each other with the Danbury turbines built into ridges on Tinkham Hill, and the Alexandria turbines erected on Forbes Mountain. Residents of the two towns wouldn’t directly see energy savings from the wind turbines, but may see savings overtime, Cherian said. “Given how low the prices are for the power, it helps to gradually lower power rates,” he said, adding the towns would see an increase in revenue — Danbury more than a half million dollars and Alexandria roughly $300,000 — from property taxes assessed on the land where the project is built. In addition, annual payments would be made to the land owners, he said. Cherian said the project, large enough to serve 30,000 customers, is in the very beginning of its planning stages and still has many regulatory steps to pass through — including approval from New Hampshire’s Site Evaluation Committee — before the final go-ahead is given. He said its hard to predict when construction could start, but its not likely to be next year. Iberdrola is expecting to sell the power generated from the turbines primarily to Massachusetts based-NSTAR, the parent company of Public Service of New Hampshire, he said. State Rep. Chuck Townsend, D-Canaan, vice chairman of the House Science, Technology and Energy Committee, said overall he supports wind projects and doesn’t think the Wild Meadows project should be blocked solely over aesthetic concerns. He said, though, the project deserves a thorough evaluation from the committees and commissions involved.